There are nine opportunities to go soul winning at the Longview Baptist Temple each week. One of the main times is Wednesday night at 6 pm. There is always a great crowd for soul winning each Wednesday. Last night I had the honor of going with two of my grandsons R G and Jordan. R G was born with multiple birth defects and he is a walking miracle. The doctors thought he would never live let alone walk and talk. However, here he is and what a blessing he is. He thinks the whole world is abnormal and he is the only normal one alive. He may be right! Tonight R G and I were able to lead 3 to Christ. Tony, his wife Daffney, and their little son prayed and trusted Christ to be the payment for all of their sins. It was great! 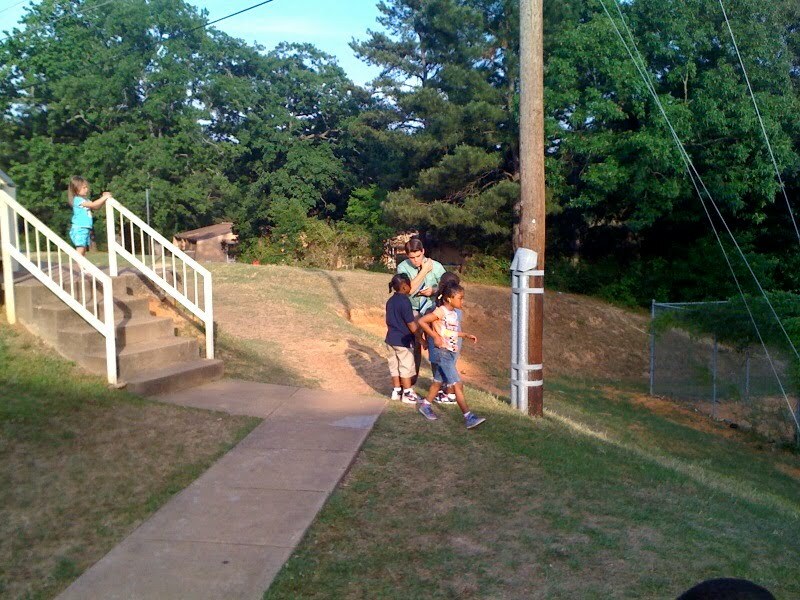 In the mean while Jordan found a play ground at the apartment complex and began to talk to the children there about the Lord. After a while we joined up with him and I spotted him writing the names down of those who asked Christ to be their personal Saviour. We have a Sunday school bus route that comes through these apartments. Those names will be given to that Bus Captain. Hopefully we will be able to reach their parents this week end also! Gotta love soul winning!